We would like to present a topic addressing specifically moles around the Lip | Mouth | Nasolabial Fold area. Below is a before and after using the cO2 laser to remove these moles. This is one option. The laser is used to take down the mole. The benefit is that only the area of the mole needs to be treated. So with the co2 laser you can limit the amount of tissue you actually work with to basically just the mole. Not much involvement of the normal tissue around the mole occurs with the lasering. This can be considered better than excision (removing tissue through cutting) | incision (the actual cutting part of the procedure) of the mole because with excisional techniques you usually need to take out some normal skin when you excise the mole out. Excisions require a crescent | wedge shape design to remove the mole that is usually 2 times the length of the mole or more. The reason you need to do this is to avoid dog ears at the end of the incisions when you close the excised area of the mole. Dog ears are areas of excess skin that can cause puckering or bumps at the ends of incisions if they are not removed before closing. With excisions, some see having a longer incision as a drawback with excisional techniques. However, the benefit of excisional techniques | or techniques that call for cutting the mole out is that the healing is better controlled than with the co2 laser. The drawback with co2 laser removal is that the mole will heal as an open sore and the healing will be harder to control and more scarring can be possible. The pictures below are the before and after pictures after laser mole removal. 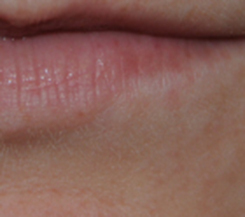 As you can see in the close up of the after picture for the co2 laser mole removal of the lip | mouth | nasolabial fold moles | skin lesions, the scars are hard to see. She had near perfect healing. Note this picture is not touched up in any way to improve the results.